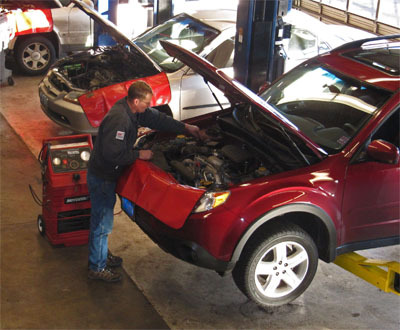 Factory scheduled maintenance has been proven to prolong the life of your car, truck or SUV. It will also help maintain the value ofyour car and keep you safe on the road by preventing repairs. Typical recommended maintenance items recommended at major mileage intervals. Call us today at 503-693-8600 or stop by 1929 NE Cornell Rd., Hillsboro, OR and our ASE trained technicians will be happy to help you go over your vehilces needs. Many times the manufactures recommendations may not fit your personal driving habits or lifestyle. Having a certified technician examine your car on a regular basis can help you assess the true needs of your car, truck or SUV. Recommended every 45,000 miles or with brake system service. Inspect pads, shoes; brake hydraulic system, reservoir and cap; rotors, drums; brake lines and components; test parking brake; flush brake fluid. Recommended annually. Check all hoses and belts; pressure test system, check for leaks; check heater, defroster and cooling fan operation; replace antifreeze; road test vehicle. Recommended every 30,000 miles. This service helps reduce emissions plus improve drivability and fuel mileage. Clean throttle body area; use induction system cleaner to clean fuel injection system and remove carbon build up and deposits. Recommended every 30,000 miles. Add flushing cleaner to transmission; completely flush all transmission components and replace all transmission fluid with new fluid; check for leaks; road test vehicle. Recommended annually for best A/C performance. A/C performance test; check system pressures; check condenser and cooling fans operation; inspect A/C components for wear, leaks and proper operation. Check interior vent temperature for proper specified cooling. Complete power steering fluid flush. Inspect all components for wear, leaks and proper operation. Recommended every 30,000 miles.